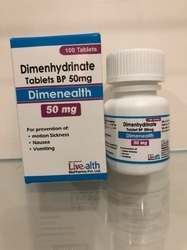 Our product range includes a wide range of chlorpheniramine maleate tablets, desloratadine tablets 5 mg, fexofenadine hydrochloride tablet 180 mg, levocetirizine dihydrochloride tablet, dimenhydrinate tablet 50 mg and paracetamol & chlorpheniramine maleate suspension. 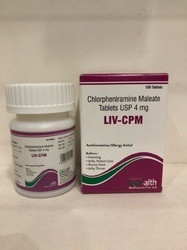 Chlorpheniramine Maleate Tablets USP 4 mg Chlorpheniramine is an antihistamine used to relieve symptoms of allergy, hay fever, and the common cold. These symptoms include rash, watery eyes, itchy eyes/nose/throat/skin, cough, runny nose, and sneezing.This medication works by blocking a certain natural substance (histamine) that your body makes during an allergic reaction. By blocking another natural substance made by your body (acetylcholine), it helps dry up some body fluids to relieve symptoms such as watery eyes and runny nose.Packing: 100 Tablets in a jar with a printed carton. Packaging Details: 100 Tablets in a Jar with a printed carton. 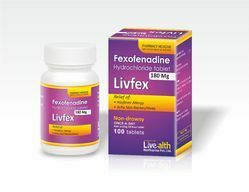 Fexofenadine is an antihistamine used to relieve allergy symptoms such as wateryeyes, runny nose, itching eyes/nose, sneezing, hives, and itching. It works by blocking a certain natural substance (histamine) that your body makes during anallergic reaction. Cetirizine dihydrochloride is an antihistamine that reduces the effects of natural chemical histamine in the body. Histamine can produce symptoms of sneezing, itching, watery eyes, and runny nose. Cetirizine dihydrochloride is used to treat cold or allergy symptoms such as sneezing, itching, watery eyes, or runny nose. 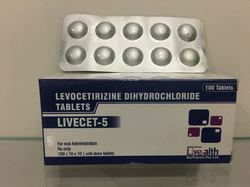 Cetirizine dihydrochloride is also used to treat itching and swelling caused by chronic urticaria. Cetirizine dihydrochloride may also be used for purposes not listed in this medication guide. 10x10 tablets in alu alu blister pack in a printed carton. Dimenhydrinate is used to prevent and treat nausea, vomiting, and dizzinesscaused by motion sickness. 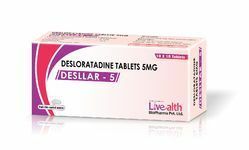 Dimenhydrinate is in a class of medications called antihistamines. It works by preventing problems with body balance. 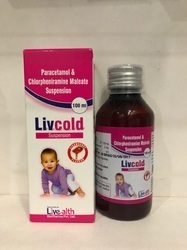 Livcold – Paracetamol & Chlorpheniramine Maleate SuspensionThis combination medication is used to temporarily relieve symptoms caused by the common cold, flu, allergies, or other breathing illnesses (such as sinusitis, bronchitis). Antihistamines help relieve watery eyes, itchy eyes/nose/throat, runny nose, and sneezing. Decongestants help to relieve stuffy nose and ear congestion symptoms.If you are self-treating with this medication, carefully read the package instructions to be sure it is right for you before you start using this product. Some products have similar brand names but different active ingredients with different uses. Taking the wrong product could harm you. Ask your pharmacist if you have any questions about your product or its use.Packing: 100 ml Suspension in a pet bottle. Packaging Details: 100 ml suspension in a pet bottle. 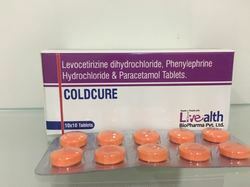 We are suppliers of coldcure tablets, it contains Levocetirizine Di HCL, Phenylephrine HCL& Paracetamol Tablet.